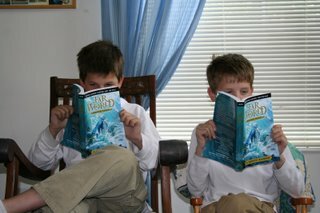 After reading and reviewing the book, I met with J. Scott Savage, author of Far World – Water Keep. We had a nice chat about the book, which will be on the shelves in September. Of great interest to me was Scott’s writing process, so that is what my questions focused on during the following interview. I’ll tell you, that Scott, he is quite the jokester! Qu: You made it to the Milwaukee stop on your blog tour! Hope you had a great trip. How was the plane? First class, great hosts, no one had a heart attack or anything? I was on a plane, just after take-off – man had a heart attack. Pilot had to dump all the fuel before we could land. Did you know sometimes it rains plane petrol on you? Scott: How lousy would that be? You’re heading out to that big job interview. Your hair looks good. You just bought a new suit, and suddenly 5,000 gallons of gas washes over you. Of course it would be worse if you were smoking, huh? This flight was actually pretty good. Lame movie was the worst of it. Qu: I am glad to hear that. I know you have had some pretty wild trips. 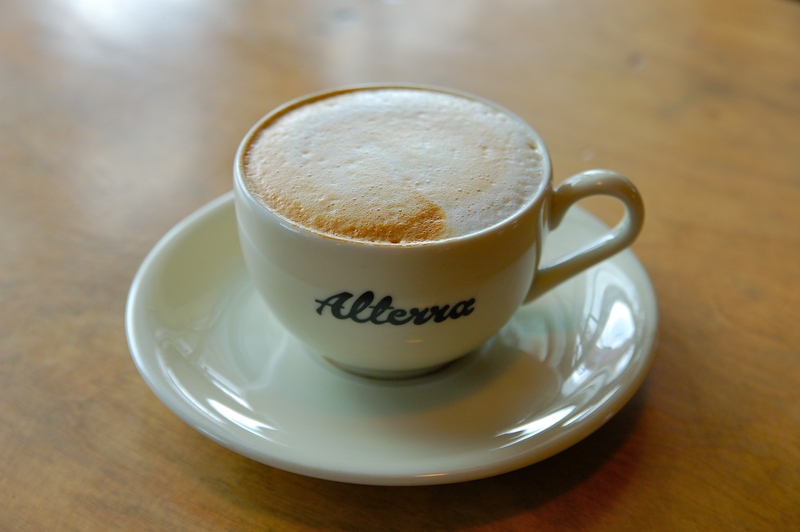 Well, thanks for popping into my office – Alterra – Humboldt Café, for a cup of coffee and a chat with me. 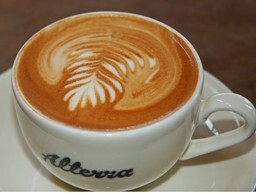 Alterra makes the best coffee – they buy Free Trade beans and roast them right here, so it gets a little noisy sometimes. Scott: Great atmosphere. Much better than Starbucks. But what the heck is a Free Trade bean? It sounds a little like a free range chicken. Makes me wonder if they are a whole bunch of little beans wandering around some field, hanging out, telling bean jokes. “Yeah, it’s a good life until the coffee grinder shows up. Then it’s not so pretty.” So what does the big spinning thing do? Qu: Well when the little beans get tired of wandering around the field telling jokes, that spinner thing gives them a lift. Let me get you some coffee… or… What do you like to drink? I am going to have the barista whip up a cappuccino for me. Scott: Looks good. You can probably read your fortune in the froth. “I see that you will meet a tall dark man with a beard that looks kind of like this.” I’m not much a coffee drinker, but I am a serious cocoa connoisseur. Do they have that here? Qu: Of course, cocoa it is. Coffee is a big part of my writing life. Once I have that cuppa, my fingers start flying, so I do a lot of my writing here. The dog hasn’t figured out where I am yet, so I’m not interrupted by having to take walks – other than walking to the bathroom. Oh nooooo, don’t turn around… here she comes. Quick, give me your baseball cap. Scott: Here you go. Duck your head and try not to smell like yourself. Qu: That was a close call, but she didn’t spot me. Whew. Scott: Yeah, I think she’s headed for a likely looking fire hydrant. Qu: Anyway, my question is where do you do your writing?. Scott: I like to write just about anywhere. One of my favorite places is the library. I like to imagine that I am soaking up inspiration from all the great books. Qu: Writing at the library is a great idea. I have never tried it. 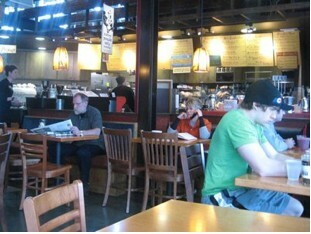 Nice big tables, quiet, …..actually, I would probably fall asleep. Back to my question: I am really interested in the process…. could you describe your writing process a little? Do you write, edit, write, edit vs. write straight through and then go back, or? I’d love to be able to just write straight through, but I’m a write, edit, write, kind of guy. Qu: Do you ever hit a wall? Ooops. 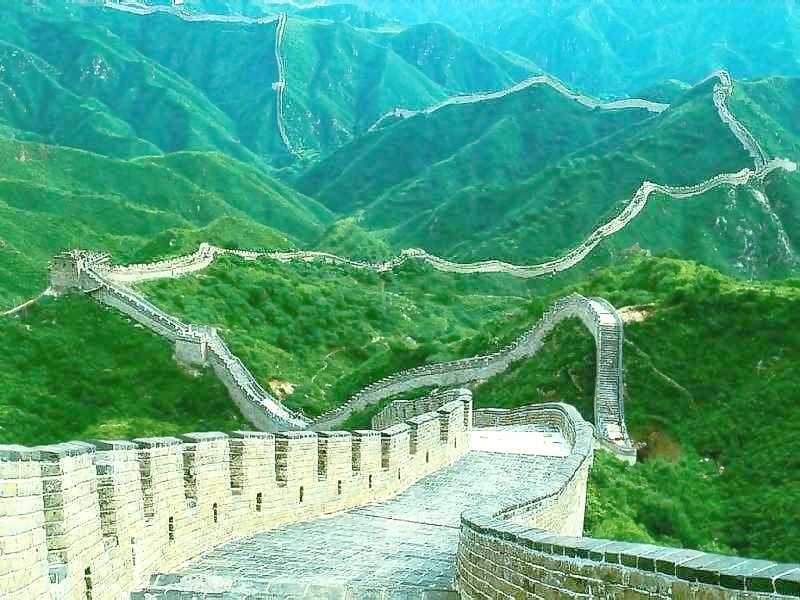 Not that wall. You know what I mean. Scott: Each day I reread and edit what I wrote the day before. It helps me get back into the story and get my imagination flowing. Qu: Does anyone read your work while you are writing? Who do you have read your work after it is completed? Scott: I usually let my wife and my critique group (the infamous Women of Wednesday Night) read my book before it’s done. Also some other family members. Qu: Since this is a YA book, do your kids have any part of the process? Scott: I prefer that my kids wait until a complete draft is done, so they can enjoy it more. But hey, if they promise to clean their rooms . . .
Qu: I don’t think that bribe would work with my kids, but I guess I could try it. How much time a day do you spend on this job of writing? I mean the whole thing, from blogging to talking to agent/editors, and so on. Scott: Way too much. I suspect I spend as much time on my writing as I do on my full time job. It really is a second job. Qu: Do you have more than one project going at a time? Scott: I have lots of projects in my head. But I try to focus on writing one book at a time. It’s too easy to confuse voices if I don’t. Qu: When you started Water Keep, did you already have in mind that this was going to be a series? Scott: I knew the basics of the series when I started. But for me, part of writing is discovery, so I knew a lot more about the world and what was happening. I have a lot of “light bulb” moments where I discover something major about the story that I didn’t expect. I know quite a bit about the series now. Definitely how it will all end. Qu: Can I get you something else to drink, or eat? They have great bakery here…the scones are really good. Scott: How can you turn down a good scone? They do have honey-butter right? Qu: Sure, they have that too. (Okay guys, now that I have primed the pump, maybe I can sneak in this trick question and he won’t notice…..) Can you tell us something about the next book in the series? Scott: Mmm, scones the plot of the next book is . . . hey wait. 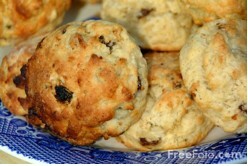 The old scones and cocoa trick. I should have seen it coming. That’s it. I’m calling your dog back. Okay, how’s this for a clue. There is no such thing as a Land Elemental. Qu: Oh boy. A clue. I am going to have to mull that over. Well, thanks so much for coming all the way to Milwaukee to chat with me today, Scott. Before we say goodbye, I have to tell you I loved Water Keep. I was a teacher of students with special needs, so your hero really touched me. The review of the book was posted on July 23rd, so folks can go there to get a taste of this great fantasy. 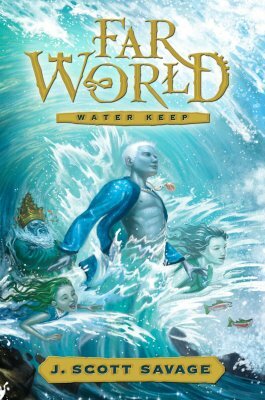 It was great meeting you, and I wish you good luck with the upcoming release of Far World – Water Keep in September! Are you sure you wouldn’t like a chocolate filled croissant or something, before you head back to the airport? Scott: Chocolate-filled croissants? Are you kidding me? Shoot, I’m filling up a bag. It was great meeting you as well. I’m so glad you liked Water Keep, and I totally applaud you for your teaching. I hope that if my book does nothing else, it will give kids hope that they can overcome any obstacle. Hopefully I can get a chance to tell them that in person as I visit schools. And thanks for the fun interview and the great review! Qu: It has been my pleasure, Scott. Look out for the dog when you go out the door. She likes croissants, too. To make fantasy readers doubly happy, there is a book give-away. If you would like to enter the drawing for an author-autographed (with a personal message!) copy of the advance reader’s edition, just make a comment on this interview, or the review of the book. You can have a copy of this book before it hits the shelves in September, ensuring the envy of all your friends! Winner chosen on July 30th. Note: coffee, food, and coffee house pictures belong to Alterra. Wonderful conversation! I thoroughly enjoyed it-but now I’m dying for coffee and croissants! I think a trip to First Cup (my neighborhood organic coffee house) is definitely in order. 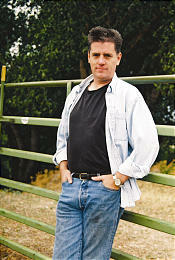 Although fantasy novels aren’t really my thing, your interview with the author has tempted me. See how effective you are?? Go for the coffee and croissant, Becca… it is Saturday morning, after all! Scott is a fun, funny guy, and the book is delightful. It is just the sort of book young adults should read, and will enjoy reading. Thanks for visiting, but you will have to excuse me, I have to go up and get a refill. First, the picture of the coffee stopped me in my tracks…hold on…OK, having poured myself a cup (from my kitchen, but it’s made with free trade beans!) I went on to read every bit. Love the pictures, love the interview. Excellent intertwining. 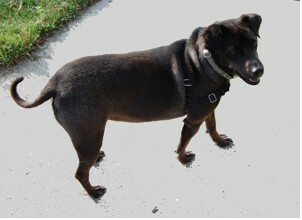 And of course, your dog! Would love to win a book, too. 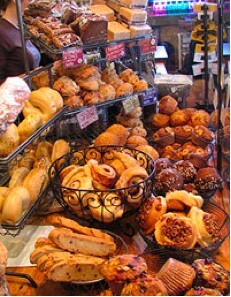 And now, since there are no scones in this house, I must rally and run to BreadCo where they are sure to have some left at this hour. Thank goodness I was already drinking a nice iced latte when I read this. What a fun interview! Too bad I can’t send a cappuccino through the wires, Oh! Glad you had some beans handy to fix yourself up. The bakery gets me every time. Someone should do something about the calories, though. I am glad you enjoyed the interview – it was fun for me. Hi H.L. – iced latte sounds good about now… it is pretty warm out. I have another Coffee House Series interview coming up in two weeks, with Sandra Balzo. Get your latte ready! Excellent interview, and what an office! 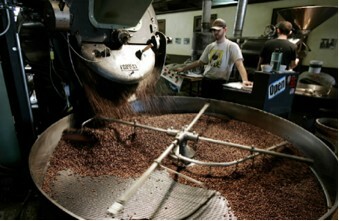 I wish I had coffee roasting in the back of my office, whether it is free range or free trade. Thanks, Authorbookfan. The interview was fun. I am very lucky to have such a great work place. That coffee roasting smells dang good, too. Very fun interview! How cool that you actually got to meet him for the interview! I’m looking forward to getting to my review copy soon, from all I have read it is going to be well worth reading. Well Carl, it is a blog tour…. we did have a virtual meeting… but it was fun! Interesting interview. I love your thoughts and posts on the writing process. Most thought provoking and inspiring! Good job! Loved the interview. Loved the photos. It was all a real hoot! That coffee and those pastries look heavenly! Thanks, Pamela. I have really been thinking about that old writing process lately, and it certainly comes up in conversation here. I am enjoying Bird By Bird right now, which is a great chat about the subject (writing – not birds). Come on over, Stefanie. I’ll buy you a coffee and a pumpkin/orange/cranberry muffin (my personal favorite). The interview was fun. A ‘hoot’ is a good way to describe it! motivation for enhancing your body further. Having a demanding work schedule, you need to look for ways in losing weight without having to sacrifice your job.